Sponsors included Global War Studies: The Journal for the Study of Warfare and Weapons, 11919-1945 together with the National Intelligence University and the United States Holocaust Memorial Museum, both located in Washington, DC. The conference was held at the Royal Military Academy Sandhurst, the legendary military school, where thousands of young Englishmen including such famous figures as Bernard Montgomery, Winston Churchill and more recently Prince Harry had trained as junior officers since the Napoleonic Era. Our living accommodations varied. Most of the delegates, which numbered about a hundred and fifty, stayed at local hotels in Camberly, the village just outside main gate. Those of us who applied early had the rare opportunity of staying on the Sandhurst campus. Some lived at Victory College while others, like myself, were housed in the “Slim Annex” (opened in 2004) named for Field Marshall William Slim, a thrice wounded veteran of the First World War who commanded troops in East Africa, the Middle East and the Burma Campaign during the Second World War. Great Britain’s infamous rainy, soggy spring weather never appeared. Instead we all enjoyed a week of cloudless days of brilliant sunshine and cool evenings which continually freshened our spirits while revealing the Sandhurst campus in all its majesty. The conference agenda partnering with the weather offered everyone the delight of moving back and forth between panels held at the venerable Old College and formal lectures at Woolwich Hall opposite the Royal Military Chapel. You’ll quickly note from a read of the conference program that the panels were generally Euro-centric in nature. Given the pivotal nature of 1944 and the upcoming seventieth anniversary of the Normandy Invasion this only makes sense. What was encouraging was that about a third of the panels examined the previously under-examined war in the Pacific or as some called it the Asian War. The Asian experts included both Americans and a small handful of Japanese scholars as well. Curiously, however, there were no scholars in attendance from the Peoples Republic of China, Taiwan or Russia. I was fortunate enough to chair one of these panels. Standing in the magnificent Indian Army Room it was a privilege to introduce my group which included Dr. James Perry, an executive with the Northrup-Grumman Corp. in Washington, DC who pursues a passion for history as an independent scholar in his spare time. Next was Dr. Klaus Schmider, a professor of history at Sandhurst and Dr. Jill Edwards, a historian at the American University at Cairo, Egypt whose paper entitled “Cairo Spies: Problems of Intelligence Appraisal in Early Post-War Planning” was of particular interest to me. Because historians generally conduct their work alone in dusty archives and libraries conferences such as these offer the chance to meet colleagues who share similar interests. This conference was particularly useful for me when three excellent historians studying different aspects of German foreign intelligence operations during the Second World War confirmed conclusions in my new book Hoover’s Secret War. A gratifying payoff and an excellent conference experience. Click on image to enlarge and read caption. In front of the entrance to One Grosvenor Square which served as the American Embassy during WWII. In November 1942, FBI Director Hoover assigned 28-year-old FBI Special Agent Arthur Thurston to London as his first representative to MI5 and MI6 thus changing the course of Anglo-British relations. Another view of the Embassy. Statue honoring President Franklin D. Roosevelt in London’s Grosvenor Square across from the old American Embassy. Another shot of the embassy which today houses the offices of the Canadian High Commissioner. View from the embassy of Grosvenor Square. During World War II, this beautiful image would have been the scene of sand-bagged bunkers, ugly Quonset huts and a huge tethered barrage balloon floating high above everyone. Also at Grosvenor Square: Statue of SHAEF Commander General Dwight D. Eisenhower. In front of Old Bailey Criminal Court in London where American Embassy communicator Tyler Kent was secretly convicted and sentenced in 1940 to twenty years in a British prison on espionage charges. Sir David Petrie, the MI5 DG, took FBI Special Agent Arthur Thurston (who was assigned to London) to a secret espionage trial to demonstrate his keen interest in forging a cooperative relationship with Hoover. Read my new book for details. A beautiful morning view of the lake and playing fields of Sandhurst. Old College and New College stand in the foreground. The late afternoon sun captures the beauty and majesty of the Royal Memorial Chapel Sandhurst. The magnificent Indian Army Room at Old College. 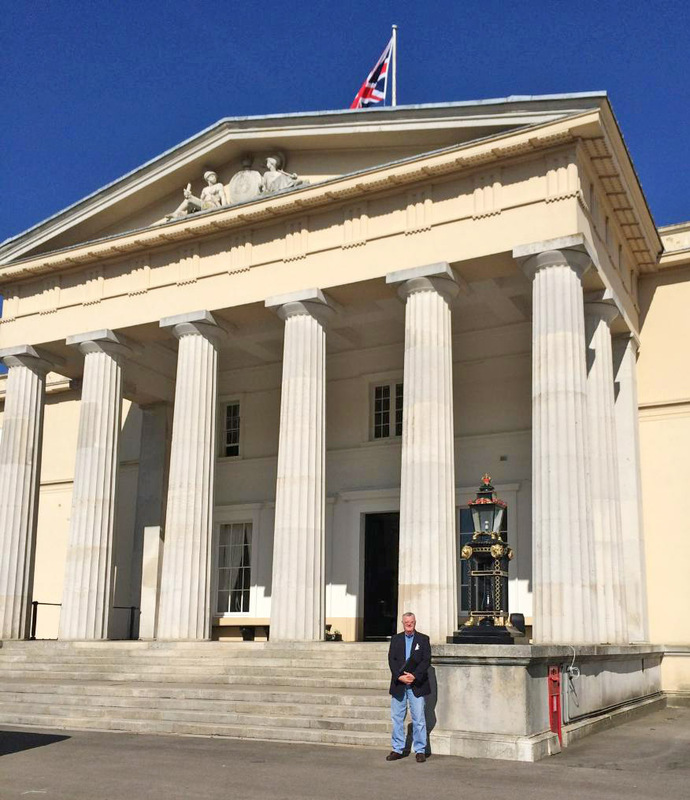 Standing in front of New College at Royal Military Academy Sandhurst. British Major General Stewart Skeets, CBE, Commander General of Sandhurst offering closing conference remarks at Woolwich Hall. Author and colleagues relaxing at the conference’s closing dinner. A portion of the head table at the conference’s closing dinner. In the foreground is Robert Von Maier, conference organizer and editor of Global War Studies. Seated next to him is noted WWII historian Professor Richard Overy of the University of Exeter. The beauty of New College at night. Challenge coin forged to honor more than 70 years of FBI friendship and cooperation with British partners. Back of the challenge coin.